Authorities have released more information about a fatal three-vehicle crash that happened Thursday near Garner in north-central Iowa. The Iowa State Patrol reports the accident happened on U.S. Highway 18 shortly after 4:45 p.m. as two vehicles were eastbound on the road with a westbound vehicle crossing the center line, striking the first eastbound vehicle, which landed in the south ditch. The other two vehicles then collided head-on and remained on the roadway. Fifty-five-year-old Darla Asche of Garner was driving the westbound vehicle and was killed in the crash. The first vehicle Asche’s car struck was driven by 62-year-old Norma Lovstad of Burt, with 84-year-old Donna Geving being a passenger. 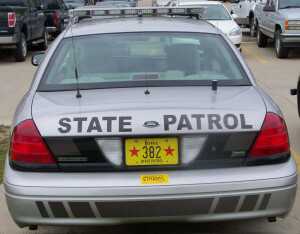 The other vehicle was driven by 26-year-old Megan Brood of Rockwell. Lovstad, Geving, and Brood were taken to Mercy-North Iowa in Mason City. Their conditions are unknown.